Where should soy sauce be applied to the sushi? 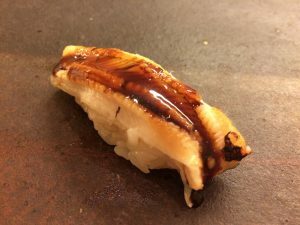 The most delicious way to eat sushi at restaurants where the sushi chef applies Nikiri (soy sauce perfectly evaporated with sake) for you is just the way it was prepared. However, at restaurants where sauce is not applied for you, the sushi is eaten by dipping it in soy sauce. The soy sauce used for dipping is provided for you at the counter or table. Many restaurants use the same evaporation formula for the dipping soy sauce. Soy sauce for dipping is put into a small dish for use, but don’t put in too much. It depends on the depth of the small dish, but the diameter of the circle of soy sauce after being poured should be approximately 25mm. When dipping sushi into the soy sauce, turning it upside down (although it will be somewhat tilted) and dipping the topping seems to be the most common method. If you keep the topping on the bottom when you put the sushi in your mouth, the flavors of the soy sauce and the fish are in complete harmony and the delicious taste spreads through your mouth. There is also an opinion that turning the sushi upside down for dipping is unacceptable practice. There are also some with the opinion that whether to eat with your hands or chopsticks depends on the situation. Make sure not to get any soy sauce on the Shari (vinegar rice). You don’t want to add unnecessary saltiness to the Shari, which has already been seasoned. It would be a terrible waste to cancel out the exquisite balance of the topping, wasabi and Shari with the saltiness of soy sauce. 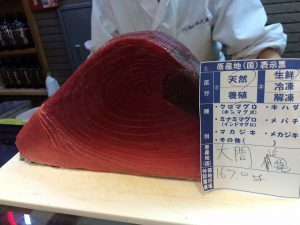 Posted on May 28, 2018 Categories Basic KnowledgeTags Edomae Shigoto, Nigiri sushi, NikiriLeave a comment on Where should soy sauce be applied to the sushi? 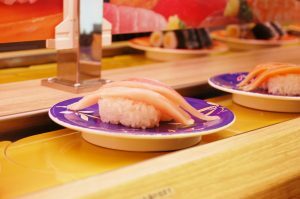 Why are the prices at fancier sushi restaurants and Kaiten-zushi (Conveyor belt sushi) so different? 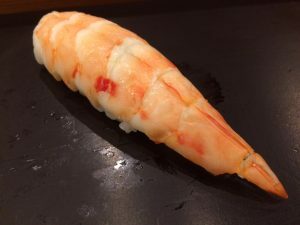 In some cases a two-piece sushi dish you can get for JPY 100 at Kaiten-zushi (Conver belt sushi) can cost up to 2,000 for half the volume at a fancy restaurant. Many Kaiten-zushi establishments are part of large chains so costs are kept low by buying in bulk. 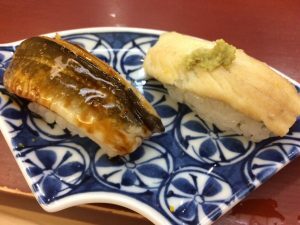 Also, unlike the fancy restaurants, which procure the best seasonal catch from fishing grounds all over the country, Kaiten-zushi uses a combination of frozen and farmed fish as well as substituting some fish for certain toppings. 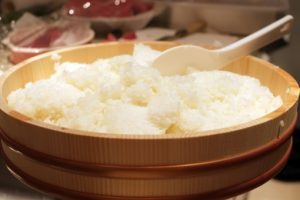 For example, Engawa is often thought to be from Japanese flounder, but Pacific halibut or Greenland halibut is used instead as a substitute. 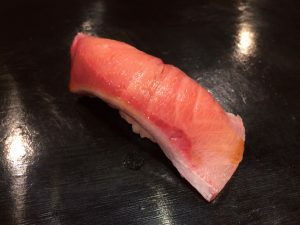 While different from fancy sushi restaurants that serve various seasonal fish and edomaeshigoto, Kaiten-zushi has its own merits and offers sushi at a much lower price. It’s really up to the customer what they hope to get from their sushi experience. 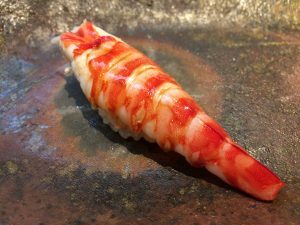 Posted on July 3, 2017 September 12, 2018 Categories TriviaTags Edomae Shigoto, Nigiri sushi, Substitute fishLeave a comment on Why are the prices at fancier sushi restaurants and Kaiten-zushi (Conveyor belt sushi) so different? Sushi restaurants that advertise “Edo style” on the sign somewhat fear customers who order Anago right off the bat. 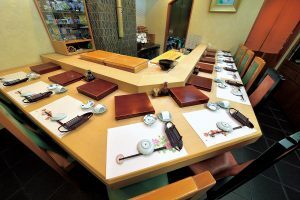 If the customer then eats as if they are really taking the time to taste the sushi, then any chef not fully confident in their skills will want to hide under the sushi counter. 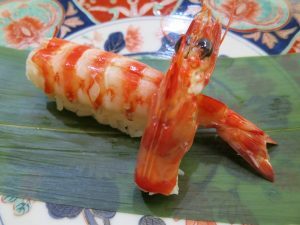 Anago is a topping that really　demonstrate a chef’s skills (or lack thereof). 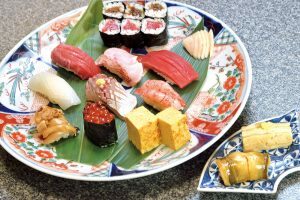 Edo-style sushi chefs work on many toppings. Anago is a perfect example of these toppings. It is actually first steamed to remove the fat. However, it’s a difficult balance to remove the fat while still leaving the umami. The steamed Anago is then boiled and flavored. Since the fish is plain, the flavoring is also a subtle skill and not an easy task. 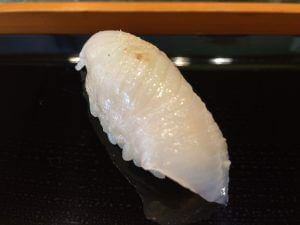 Depending on the shop, the chef may make the sushi with the boiled fish, use Nitsume (boiling down) to bring out the flavor or lightly roast the fish before combining it with the rice. The chef’s ideas and abilities are apparent in the final dish. If the sushi is made from the freshly boiled fish, it should be soft and melt in your mouth…if the chef knows what they are doing! Lightly roasted Anago will have an aroma that fills your entire mouth. 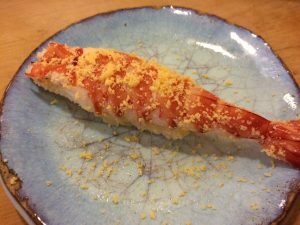 The work this topping takes to serve is a chance for sushi shops to show off their specialties, but it is also a clear indicator of the quality of the shop. 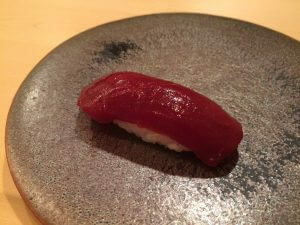 The level of the chef and quality of the sushi shop will be revealed as soon as you place Anago in your mouth.